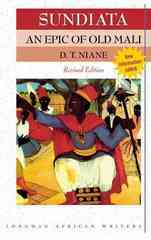 Sundiata an Epic of Old Mali 2 Edition This is a revision of Sundiata: An Epic of Old Mali, a best seller for 30 years. Retold by griots, the guardians of African Culture, this oral tradition has been handed down from the thirteenth century and captures all the mystery and majesty of medieval African kingship. It is the epic tale, based on an actual figure, of Sundiata (Sunjata). Part history and part legend, it tells how Sundiata fulfilled the prophesies that he would unite the twelve kingdoms of Mali into a powerful empire. This Revised Edition includes background information which provides a geographical, religious, social, and political context for the story. A whos who of characters and a glossary of places will enhance the readers experience.